A mistake frequently made by persons who do not know the Pennsylvania Germans is to assume that they are made up almost entirely of the plain sect people, Amish, Dunkards and Mennonites. No eastern Pennsylvanian would ever fall into this error. But so much has been written about religious persecution being the cause of emigration from the old world that there are many persons who assume that all of the Pennsylvania Germans must have been members of Protestant sects. In this too they err. There were at least two Catholic congregations among the rural residents of Berks County before the dawn of the 19th century. One of these still is existent and carrying on its proud traditions and there are clear traces of the second, still vivid in the minds of living persons. 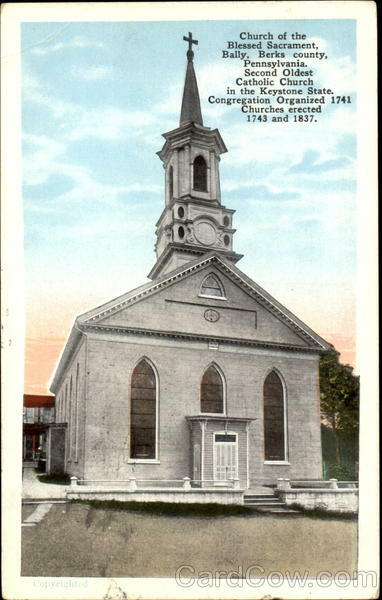 The Catholic church at Goshenhoppen, now Bally, was organized long before the Revolutionary War under the care of Father Schneider and it has ministered to the spiritual needs of its neighborhood from that day to this. The Catholic congregation at Mt. Pleasant, or Obold, on Route 83, between Reading Airport and Bernville, has ceased to exist as a congregation but there are still living persons in that neighborhood whose parents were members of that parish when the Catholic priests held services in the home of Phillip Schmidt or in the village school house. Clancy Lambert, octogenarian, still remembers the Catholic services and his father was a member of the church. Three times each year the agile old man goes to the secluded cemetery plot at the northern end of town, carrying a scythe upon his shoulder. He is going to mow the grass which has grown over the graves of his ancestors and those of his neighbors. Casual passerby will not find the hidden God’s Acre, known today as the Deppen Cemetery plot. It is nestled in a shady spot, on a hill side near to the highway but not to be seen from it. There lie buried approximately 50 bodies. 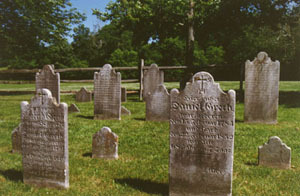 Most of those interred were members of the old Catholic church of “Hetrichestettle,” or Mt. Pleasant. Even though efforts are made to preserve headstones time and weather have taken their toll and many of them are now illegible. Fortunately Michael Gruber had the foresight 30 years ago to record inscriptions which are cut into those stones and consequently posterity can still identify the names and dates of those who lie there. The list of inscriptions was published in the Pennsylvania German Magazine, 1913, page 50. Interested persons may consult this record. Mr. Lambert tells Der Ewich Yaeger that there is a tradition that some 20 Irishman lie buried in that plot in unmarked graves. Their presence in that part of Berks is explained by the fact that the Union Canal was dug by Irish immigrants (1828). We have knowledge that a dreaded disease known as “canal fever” took a heavy toll on the lives among those who dug the great ditch more than a century ago. It is quite in accord with the circumstances of the case to believe that Irish victims would wish to be buried in consecrated ground. 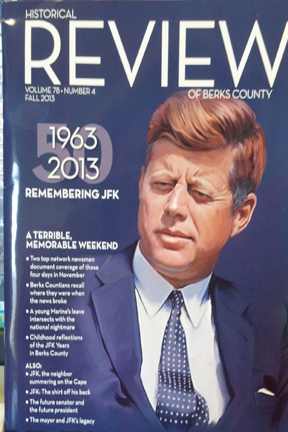 In addition to these themes, we are looking for researched articles or personal recollections on a variety of topics on Berks County history, and Berks County connections to U.S. History Events. While any period will be accepted, we are especially looking for history events for the following years: 1714, 1764, 1814, 1864, 1914 and 1964. All Articles should be between 1,000-2,000 max (exceptions could be made for an article over 2,000). We also welcome graphics, which include (but are not limited to) pie charts, graphs, tables and photographs. Any images found in the Henry Janssen Library are free for use for any article in the Review. Authors must visit the library and choose their own images for publication. When possible, articles should be properly cited with footnotes (or endnotes) and a bibliography. For more information regarding citations, please visit: http://www.press.uchicago.edu/books/turabian/turabian_citationguide.html, or contact Kim Brown at krichards@berkshistory.org. Please Note: The Editorial Board reserves the rights to edit or condense articles before publication in the Review.